I carried out my bechelor studies in "medical biotechnology" in the university of naples. i completed my training in pharmaceutical biotechnology in alma university, bologna. in both universities i acquired my strong interest in pharmacheutical field applied to human health and my will to prosecute my career on research. 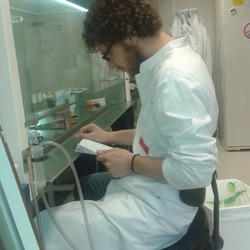 in 2013, thanks to the erasmus grant,i spent seven months in the laboratory of medical oncology of vu university medical center amsterdam where i developed a research project in the oncology field, under the supervision of dr. elisa giovannetti.this allowed me to write my master thesis project entitled "role of cancer stem cells in the aggressive behaviour of pancreatic cancer", supervised by dr. santi mario spampinato.there i had the opportunity to work in a stimulating international enviroment acquiring a high-level international profile. currently, i am a phd student in immunology in the institute of molecular apllied medicine sited in the faculty of medicine of san pablo ceu university, madrid.